All children face challenges when growing up. Aaron has no shortage of them—his grandmother’s raising him, his mother died of cancer when he was young, his father left, the school bully’s targeting him, and to top it all off, people say he’s different. But, as Aaron says, different is better than weird. Aaron fidgets a lot and gets distracted. He’s smarter than most people give him credit for, and only his teacher Mr. Collins seems to have patience for him. But this year Aaron has a lot to look forward to. His dad is coming to visit and has a surprise for him, his Big Brother Paul helped him set up a vivarium for his toad, and the new kid, Jeremy, is his friend. 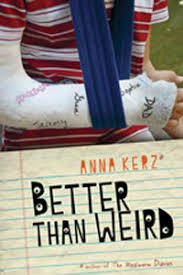 The twists and turns in this short novel paint a compelling picture of the difficulties of growing up, and provide a unique perspective in which Aaron tries to understand the world around him while always trying to be better than weird. This is a stand-alone sequel to The Mealworm Diaries. This review is from Canadian Teacher Magazine’s Sept/Oct 2011 issue.